You do not ask for much these days, just some brains and human flesh for supper. Satisfy the hunger while wearing the Zombie Organs T-Shirt. This stylish garment will let everyone know that you want one thing, brains. 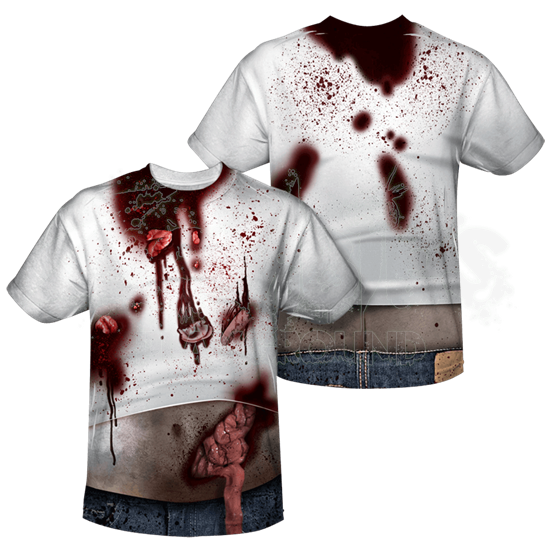 This t-shirt is designed to depict a zombies leftovers from a successful meal. Human parts are scattered all over the chest while blood spatters add color, there are even some intestines that are showing through the belly of this zombie. This garment is 100% polyester and hand printed in the USA using a dye sublimation process. Why spend your days outrunning them when you can just be one, with the comfortable Zombie Organs T-Shirt.